My daughter enjoyed a slumber party with her DC SUPERHERO GIRLS dolls watching these comic book inspired character's newest movie which just came out to view via Digital and DVD. DC SUPERHERO GIRLS portray heroes ranging from Batgirl to Wonder Woman as teenagers during their high school years. 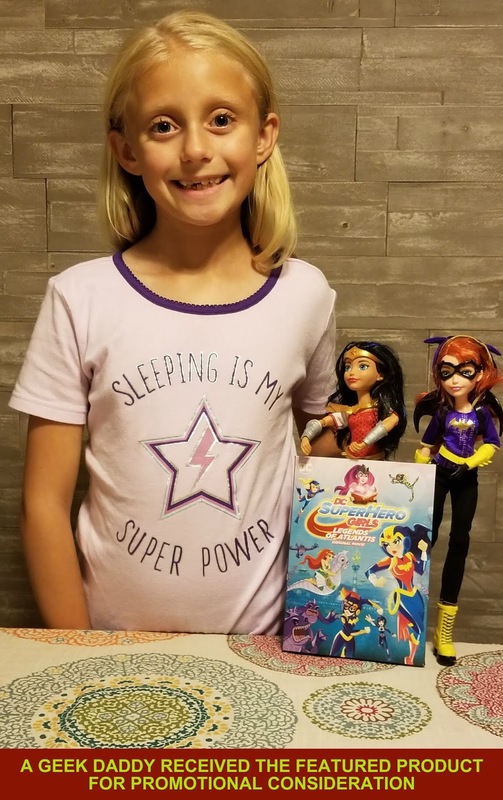 Aimed at an audience of elementary school aged children, the DC SUPERHERO GIRLS provide age appropriate action adventures that both girls and boys can enjoy through story books, comics, and movies like the recently released DC SUPERHERO GIRLS: LEGENDS OF ATLANTIS. These characters also have a toy line of action figures and dolls that receive a lot of playtime in our household. DC SUPERHERO GIRLS: LEGENDS OF ATLANTIS starts off with what seems like an uneventful day at school, if you can call any day uneventful when attending a place called Super Hero High, when the powerful Book of Legends is heisted from the high school's library. In order to thwart the theft and recover this magical book, Wonder Woman, Batgirl, Supergirl, and the rest of their crew of super powered high schooler's go on an undersea journey to Atlantis. Upon reaching Atlantis, the girls engage a pair of ocean-dwelling thieves named Mara and Siren who turn out to be some formidable foes. The DC SUPERHERO GIRLS must work together and with some help from a teenage Aquaman battle to avoid Mara and Siren from utilizing the stolen tome to unleash an army of monsters meant to subjugate the world. Can the collective powers of the DC SUPERHERO GIRLS save the day? Plus can they do it in time to get back to school without missing class? My daughter found the animated movie exciting and really enjoyed watching it. In fact, she talked it up so much that her brother who didn't want to initially see it had to watch it for himself. So the two of them watched it together again the next day after she had her DC SUPERHERO GIRLS slumber party with her dolls before bedtime the previous night. The movie's animation does a very nice job of duplicating the illustrations and graphics from the DC SUPERHERO GIRLS story books and graphic novels. If your kids are fans of the DC SUPERHERO GIRLS they are sure to enjoy this movie. In fact, most kids in the 6 to 12 years old age range who enjoy super hero adventures will be entertained by it. Because it is a fun, age appropriate action movie for children, DC SUPERHERO GIRLS: LEGENDS OF ATLANTIS gets A Geek Daddy nod of approval. 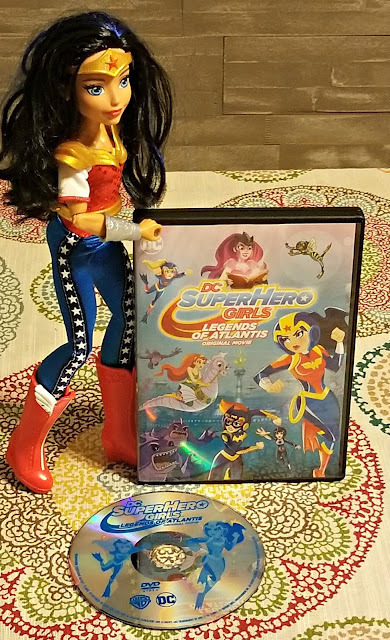 A Geek Daddy received a DVD of DC SUPERHERO GIRLS: LEGENDS OF ATLANTIS for free from Warner Bros. Home Entertainment to review. The dolls, books and comics that my family owns we purchased with our own money. Views expressed are honest and my own.